If you're working to make your landscape more water efficient, don't forget to add one of many drought-tolerant trees that thrive in the Metro Phoenix area. Trees can raise property value, save energy by shading walls and windows, and make great gifts to mark special occasions. Once established, drought-tolerant trees need minimal care and only occasional deep watering at the drip line. 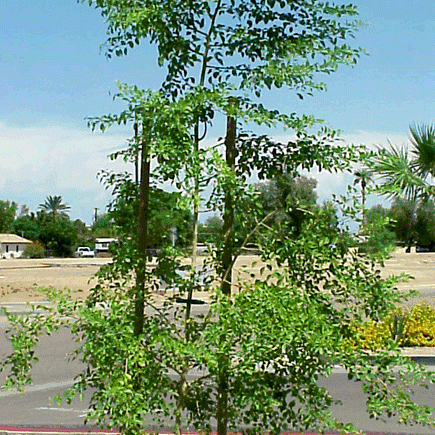 Proper staking can protect your investment and help a new tree grow tough enough to withstand rain and wind, even during Arizona's monsoon season. A new drought-tolerant tree for your yard or business also is a gift to the urban environment. Trees help to mitigate the heat island, reduce ground temperatures in the evening, and remove pollutants from the air. Trees are so important that the City of Phoenix is committed to expanding its urban forest from a canopy that now covers 9-12 percent of the city to 25 percent coverage by 2030. A new tree straight from the nursery is often top heavy, with a canopy larger than its small ball of roots. Staking gives a tree the support it needs until its roots and trunk strengthen and expand. Knowing some of the dos and don’ts about staking from the experts can save you money and produce a healthier and prettier tree. Here’s what not to do: A tree usually comes from the nursery with a stake tied close to the trunk. That’s a temporary stake and should be removed before planting. Once a tree is planted it’s not a good idea to attach a stake close to its trunk. Here are some of the reasons why. The tree cannot sway with the wind, so its roots spread more slowly leaving the tree poorly anchored in the ground. It also will suffer more wind damage. The trunk often grows wider near the top and tapers near the bottom, just the opposite of what is needed to keep the tree anchored in a storm. The tree’s bark is prone to damage. The stake shades part of the tree’s trunk making it more likely the tree will grow at a tilt. Here’s what to do: Not every tree needs to be staked. Stake a newly planted tree if it cannot stand on its own or if it is likely to be knocked out of the ground by wind, kids, dogs or other forces. Here are some basics to know before you stake a tree. Use two 2-inch wooden poles and anchor them in the ground about 2 feet deep. The stakes should be short enough to avoid extending into the canopy. Place the stakes in undisturbed soil at least 6 inches from the trunk so they don’t damage the tree’s young roots. Use smooth and broad material to fasten the trunk to the stakes so it doesn’t harm the bark. Landscapers often use a heavy wire covered with a piece of soft garden hose where the wire touches the tree. Any material made from elastic webbing or garden tape, cloth, or rubber will do for smaller trees. Allow the trunk to move slightly within the tie. Allowing the tree to move with the wind creates a dense wood and stronger trunk. Remove the stakes on a new tree in about a year. To protect the tree roots, remove the entire stake below ground and fill with dirt. Once a tree is staked, don’t be eager to prune it unless some branches are dead or badly damaged. The lower branches on a new tree help the tree grow a larger trunk and protect it from sunburn. If a new tree is on your agenda, it’s best to prepare before you visit the nursery. AMWUA’s online guide Landscape Plants for the Arizona Desert offers details about 44 drought-tolerant trees, including mature height and width, description of flowers, and amount of shedding to expect. Some AMWUA member cities cultivate demonstration gardens you can visit for free and see mature, drought-tolerant trees. The City of Glendale Tree Trail offers great information about planting and maintaining drought-tolerant trees. AMWUA member cities also are offering dozens of free landscape workshops on a wide variety of topics right now. For example, the City of Chandler is presenting a workshop called “Save Your Tree From Storm Damage” at 6:30 p.m. May 10 at Chandler City Hall, 175 S. Arizona Ave. The University of Arizona Cooperative Extension has a publication available online (pdf) all about planting and staking trees in desert landscapes. One last tip: You may want to keep those stakes after you remove them from your tree. One successful desert tree usually leads to another.